Holley Throttle Body - Billet LS UNIVERSAL - Pann Auto Performance - San Diego largest aftermarket automotive performance parts - What do you drive? 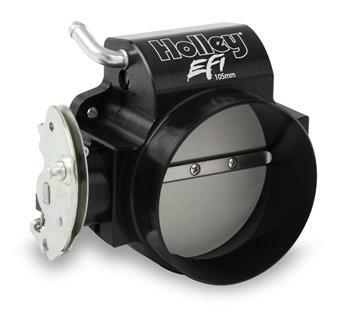 Holley’s BILLET LS Throttle Bodies are the BIGGEST BORE – MOST FEATURE LOADED available. Holley went back to the drawing board and built the ultimate air valve for your LS engine! This all new design boasts a 105 millimeter bore and a low RPM drive friendly taper. Innovative features like Idle Bleed Adjustment, TPS CLOCKER, and closable PCV Passage Valve, make them the ultimate throttle bodies for ease of installation and tuning. Regardless of whether you have a turbo, supercharger, or a big cam engine sucking gulps of air, Holley’s throttle bodies are maximized for your application. The barrier protection of the BLACK ANODIZED finish also offers up a modern tech look!